Through Gamer Goggles has set up a Kickstarter to fund coverage of Gen Con 2014, so he can be your eyes, ears, and reporter-on-the-spot.! Matt Lemke, the man behind the goggles, plans to bring you reviews, interviews, and special events in the Through Gamer Goggles style on display here. Jump into the funding pool for this one here. 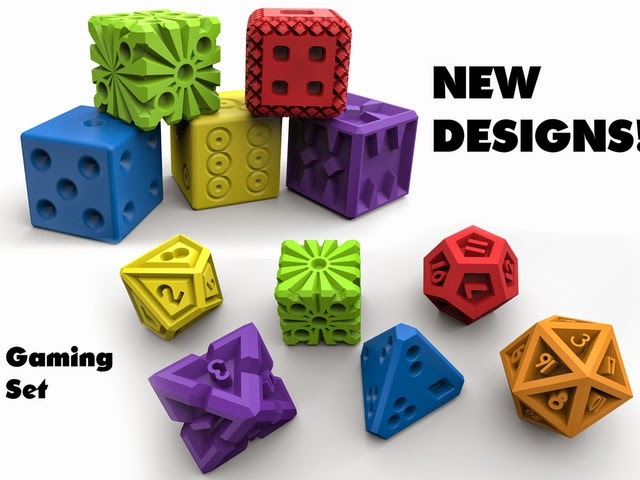 Gavin Grant has had increasing success with his Kickstarter projects and this time he has turned his focus toward "Pop Dice: 3D Printed Dice." Scroll down to see scale next to a quarter, as these are jumbo-sized dice. Pledge $50 if you want a full set of glow-in-the-dark gaming dice, six dice in all. Also, check out the Kickstarter for the Beyond Words 2016 Calendar. Lauren Zurchin is as enthusiastic as any creator I have seen on KS and has the experience to make this one a huge success. See more here!